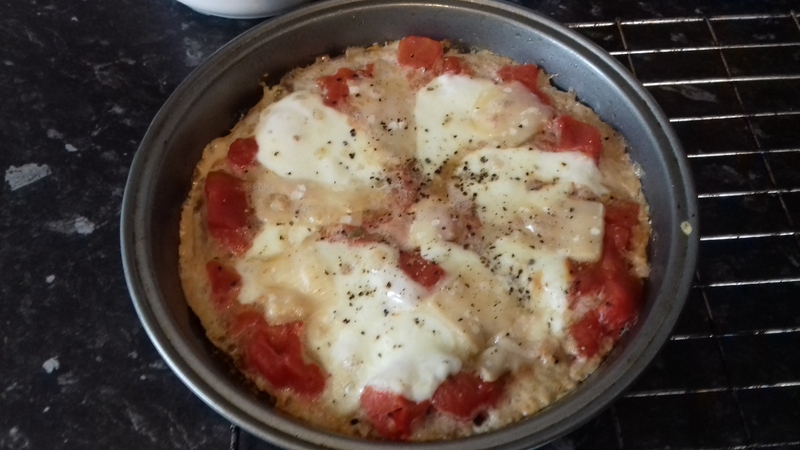 This is based on Nigella Lawson recipe I adapted – Meatzza. Basically, you use mince to create a base, and top with the traditional pizza favourites, tomato sauce and mozzarella. Nigella’s recipe uses porridge oats. I swapped these for ground almonds. They are there to give the base substance. I also changed the herb from parsley to thyme. Serve with a green salad, or to keep the Italian theme going you could try this Keto garlic bread recipe on the Diet Doctor website. Grease a 28-cm baking tin. Preheat the oven to 220 degrees C.
In a bowl, mix the meat with the garlic, ground almonds, half the grated Parmesan, thyme, salt and eggs. Do this with the tips of your fingers so you don’t overhandle the meat, as too much handling makes it tough. Press the meat into the tin. Drain some of the liquid off the tinned tomatoes. Mix with the oregano and spread it over the meat crust. Slice the Mozzarella and put it on top, along with the rest of the Parmesan. Cook in the oven for 25 minutes. Top with the fresh basil and serve. Serves 4. 5g carbs and 1g fibre per serving. As cauliflower’s number one fan, I am okay with that! Thank you! She’s brill, isn’t she? I thought crustless pizza sounded deplorable, but this actually sounds good. It’s pretty good, though better left to cool and then heated up again for serving so it solidifies a bit. I’m not diabetic but I seriously fancy this. It looks really easy as well. I assume the mince needs lots of pepper or maybe some chilli flakes? Up to you! I love heat and spice, so I always overdo pepper, but as you’ve got Parmesan, tomatoes and garlic in there, it’s quite flavoursome anyway.